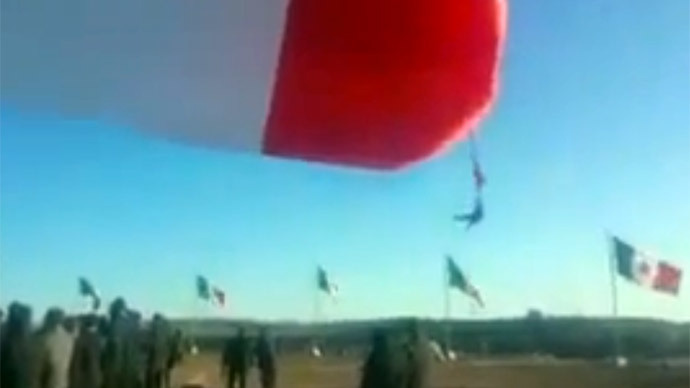 A powerful wind turned a routine raising-of-the-flag ceremony in Mexico into a tragicomic incident. A strong wind started turned a huge flag, measuring 50 by 28 meters, into a “sail”, lifting one of the soldiers standing nearby to a height of 14 meters. The 20-second-long video that went viral on YouTube has captured the flight, which was short-lived but eye-catching. As soon as the gust of wind eased, the 35-year-old soldier fell to the ground, breaking his leg. According to local publication Azteca Noticias, the soldier's rifle became entangled in the flag's fabric, dragging him with the weapon, which he wouldn’t let go of. The incident took place on May 1 in Durango, the capital and largest city of the state of the same name, as Labor Day was celebrated.